Having been on two other Bible study hiking tours to the Middle East, there were some things I expected to experience on this trip, as well. However, there were some things I did not anticipate. 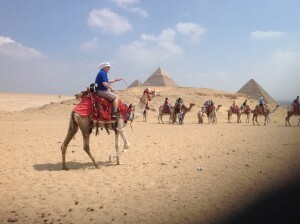 After two very full days in Egypt, here’s a run down. It would be hot–it is, but not unbearable. It would be physically challenging–we’re all tired, but the hiking has been a breeze so far. That will change! Cairo would be very large and crowded–it is but, there are lots of empty and abandoned buildings. We would have more than enough to eat at every meal–all true…delicious, too. We fellow pilgrims would bond quickly, and we have, praise the Lord! To learn that Egypt was an important part of early civilization. All the smiling, waving children as our bus travelled city streets and highways. Stray dogs and donkeys. A lot of donkeys…and goats and lambs for sell on street corners. The number of people crowded into vehicles–with babies and children in the laps of parents in the front seat. Headlights optional. Corn in the fields. Sure, bull rush, papyrus and sugar cane, but not corn. Tomorrow takes us to Valley of the Kings in Luxor, Egypt, and a late night flight to Sharm El Sheik. So expect more of the unexpected in our next blog in a couple of days. The Lord does not disappoint! A birthday in Egypt! What a blessed way to celebrate. Sounds like an amazing trip so far. Enjoying the blog and anxious to hear more! Looking forward to hearing about the “unexpected” as you explore God’s great earth! dad says it looks like an uncomfortable ride.